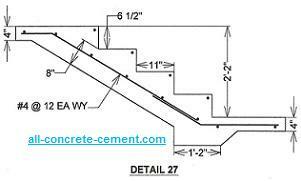 Are concrete stairs required to be reinforced, if so where do you put the reinforcements? Such professional designers such as architects and engineers require concrete stairs to be reinforced with rebars. Detail 27 below is a typical concrete step detail. The rebar is placed near the bottom about 3 inches above the ground. Since the tip of each step is the weakest point and where the stair will most likely to crack and break, a #4 or #3 bar is added for reinforcement. Per code every step in a flight of stairs has to be identical. In other words all the risers has to be equal heights. There is also height requirement that all stair risers cannot exceed. This requirement can be obtained from local city's building department. These stair design requirements are the guiding factors that determine the number of steps required in a flight of stair. Detail 27 assumes 7 inches as max stair riser. For a height of 26 (2'-2") inches divide by 7 equals 3.7 which means there needs to be 4 steps, 26/4 = 6.5 inches which is less than 7 inches. This how the calculation works as you determine the number of steps. As far as forming, the most important thing is the steps to make sure they are leveled. The rest of the steps especially the bottom where the rebars are located are not a concern, almost anything goes. Sometimes depending on the type of soil you work with, trying to back fill and compaction may be too much of a hassle to make the ground slanted as desired. To compact this problem, most contractor will do away with back filling and pour everything with concrete. The thing to watch for is to make sure the lowest point of each step has a minimum distance of 6 inches to the dirt. Detail 27 show this distance as 8 inches.